National Police Air Service EC-135. First time that I've seen it since they retired the Humberside Police helicopter and draw from the national fleet. Maneuvering hard over my work, then cruising about nearby. So they obviously did not manage to catch you!!!!! Posting this one on behalf of someone else. This is some damn fine plane spotting. And, for pictures from the ground, decent quality. I couldn't NOT share this! Over Centralia, Il, USA. Photos by Rich Jacobson. On Monday 2/25/19 I couldn't believe my luck when I happened to look up and see a pair of contrails heading my way. I thought they were a little close together to be civilian so I grabbed my camera. 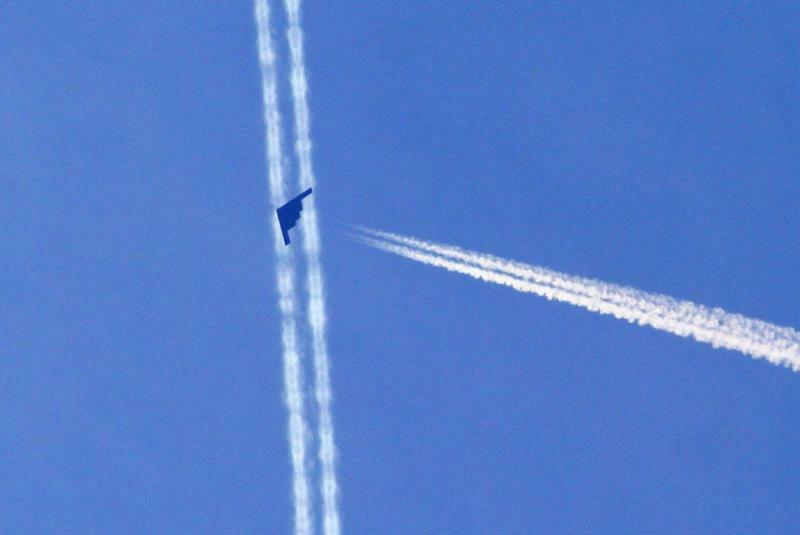 Turns out they were a pair of B-2 Spirits heading northeasterly. 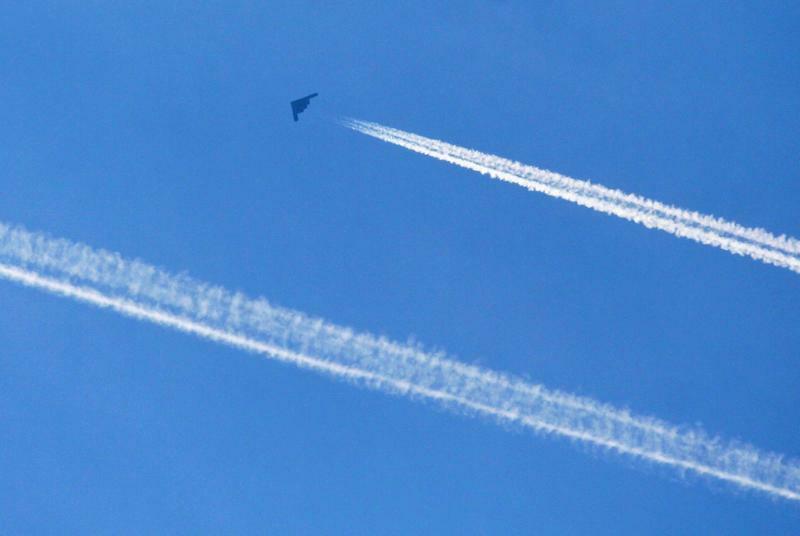 The first pic shows the lead jet flying under another jet's contrail. Second pic shows the trailer following his lead's contrail. About an hour later I heard the sound of jets, but saw no contrails. 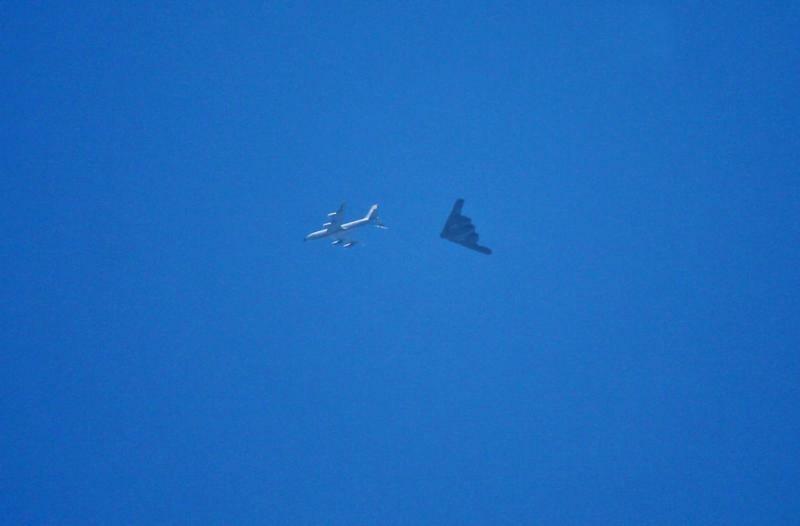 After quickly scanning the sky, I found the source of the noise, a KC-135 and a third B-2 cruising west. Not the best of pics, but thought I'd share anyway. Have a good day all!" There's a spot 15 miles North of here, as well, where they do this. I haven't been in awhile but I used to sit and watch them refuel all kinds of stuff. I always seem to forget about it but it's pretty neat to be so close to it. In other news, I DID see a train (4 that I saw, and I only got curious and looked after I heard the clatter for a few minutes) of Chinooks about 2 hours ago about a half mile North and real low. These weren't like the ones I normally see..... they must have come from the Mideast somewhere because they were all a yellowish-tan color instead of green. Is that ever cool ! Very lucky for sure. Love the refuelling pic what a treat to see that ! So on 18 January (yeah yeah, late to the party again... ) I landed at Auckland airport and saw a Singaporean Air Force 707-ish craft. Probably here to support their Boys and Girls playing with ours (as they are wont to do, more often than we realize). KC-135s come with three sizes of engine, the original ones used P&W J57 straight jet engines, the smallest of the engine variants. Later on they were upgraded to TF-33 engines with large front fan housings, and even later the KC-135R variant was re-fitted with the big fat CFM-56 engines. Wikipedia says the Singapore Air Force has four ex-USAF KC-135s. Bushfires in Gippsland meant footage on the TV news of Coulson Aviation's 737 Fireliner dropping retardant. How about that as a build Brad C? You could model it in flight with the retardant replicated by dyed cotton wool and hiding the support. I had to go look that up because this is the first time I've seen a pic of their 737. Interesting where they have the water tanks too, two of them inside the cabin ---- plus the capability of transporting ground fire fighters to the scenes, up to 60 at a time. Needs air to air refilling of the retardant tanks to cut time landing and taking of from an airport. Perhaps a C-5 or Airbus A-380? A very unusual flyby today at lunchtime over central London. A French Navy Allouette III helicopter of all things. Practically flying sideways due to the strong winds! I didn't realise that France still flew these machines, according to Wiki they are 50+ years old and now being replaced by Puma. I wonder if this one is on the way to a UK museum, possibly the Army Flying Museum? Is there any way to track past flights and find out where it came from or went? The usual Thursday Hercules low over chateau Rheged in mid afternoon. I think Thursday is the day when the SAS send a party up to Shobdon airfield to be picked up, and then dropped on their adventure playground near Pontrilas. Later, a yellow Eurocopter EC135 with the word ELECTRICITY in the side flying low over power cables in our area.....possibly looking for problems after our recent bout of high winds. There must be I would of thought. You quite often see "flight tracks" being used in news bulletins. gives a pretty good view of at least what airliners are doing now, or at a specific time.